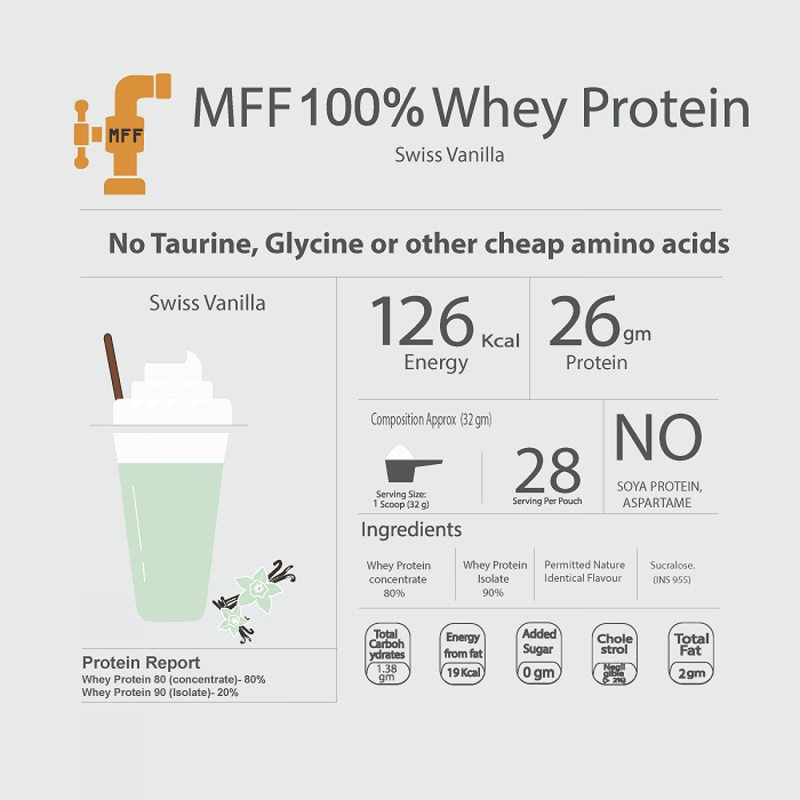 What is MFF 100% Whey Protein Blend? Formulated with high grade whey protein concentrate and whey Protein isolate MFF 100% Whey Protein is our premium protein. This protein is made keeping in mind the sports, bodybuilding & fitness goals which could be achieved in much better way. Keeping the quality standard high, this Protein Blend brings very high Amino acid profile providing almost 5.8 gm BCAA and 4.3 gm Glutamine. Branched chain amino acid (BCAA) present in this Protein blend constitutes almost 50% leucine. Leucine is directly related to increasing protein synthesis and the overall muscle tissue repair and growth. What is 80:20 Whey Protein Blend Ratio and How Good Is This Protein Blend? MFF 100% Whey Protein™ is a Whey Protein Blend which is split into 80:20 ratio of whey protein concentrate and whey Protein Isolate. This is very well researched and unique combination which brings better overall muscle growth and recovery. During different researched studies there have always been discussions on if Whey Protein isolate alone is beneficial for muscle growth specially looking at its almost double the cost again benefits and price of Whey protein concentrate. So, researching into the quick digestion, absorption and protein synthesis process of both whey protein isolate and whey protein concentrates, we formed this unique 80:20 blend which not only brings better results but better value to your overall money. Unlike most brand where they don’t disclose the amount of Isolate used, we bring 100% transparency by disclosing what you are paying every single penny for. There is nothing hidden under the name of Proprietary blend. It’s as simple as it sound, 80:20 ratio of whey Protein concentrate and whey Protein Isolate. 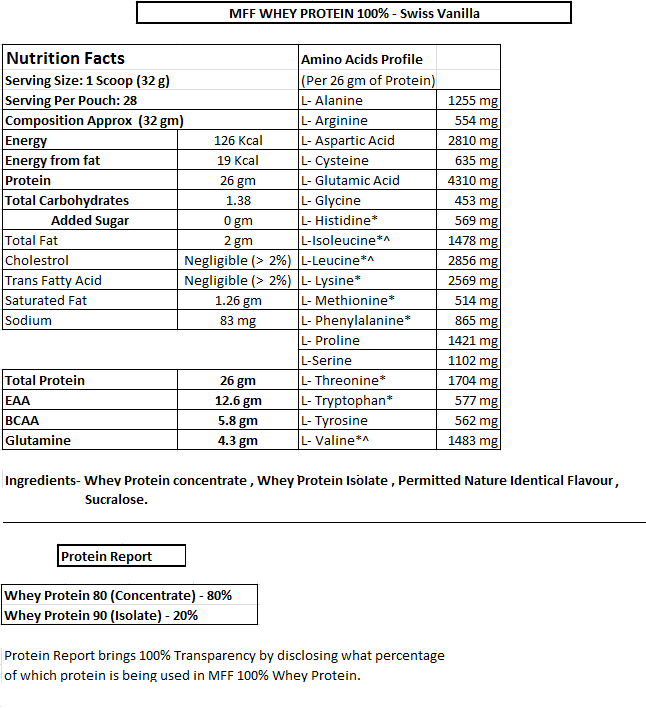 Please visit the product Protein Report above which will provide complete details on it. Why Should I Buy 100% Whey Protein? How is it different from MFF Whey Protein 80? 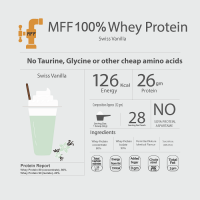 MFF whey protein 80 is made up of Pure whey protein concentrate 80% where as MFF 100% Whey Protein is made with the transparent and researched combination of Whey Protein concentrate and Whey Protein Isolate in 80:20 ratio. Whey Protein Isolate is known for 90% protein (as-in) which provides better digestion and absorption level. Making a quick repair, recovery of broken muscle tissues and overall better results. This also makes MyFitFuel product as top selling 100% whey protein in india. 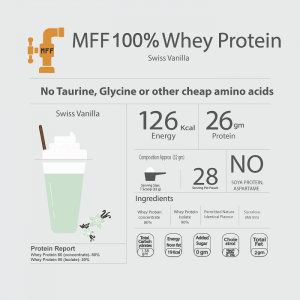 Transparency- We believe it’s your right to learn about the products actual benefits and its worth before you buy MFF 100% whey protein blend online. 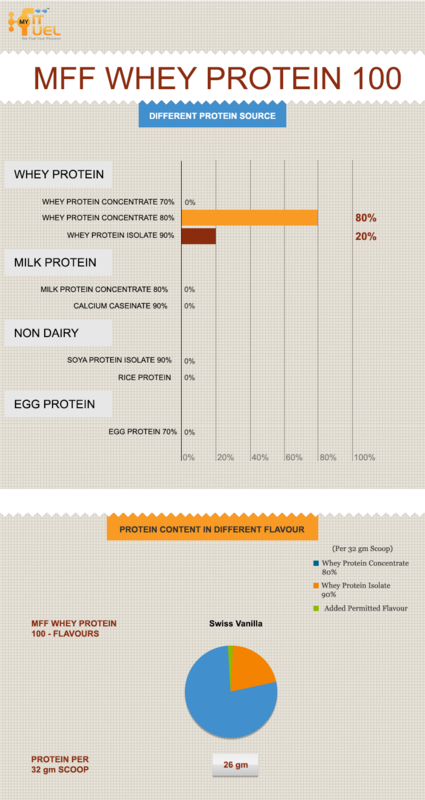 Many companies write just “whey protein concentrate” but there are different kinds of “whey protein concentrate” percentage starting from 30% protein per 100gm. So, they never disclose right percentage of whey protein concentrate and Isolate used, helping them to hide the actual worth and benefits of the product.We provide complete information telling you which protein concentrate we use. Pour 200-250ml of water in good blender like MFF™ Blender and add 1 scoop of MFF 100% Whey Protein™. Shake it for 15-20 seconds and consume immediately. Use less liquid for stronger and thicker tasting taste. To promote lean muscles, expert suggest 1g of protein per pound body weight everyday (2.2g per kg of body weight everyday) consumed during different time of the day. Some train in morning and some in evening but we recommend following important serving times of MFF 100% whey protein. Benefits of taking with Water- Taking MFF 100% Whey Protein™ with water helps you to get better Lean Muscles and reduces the overall calorie intake from your protein shake. Protein shake in water is also recommended to any individual following the weight loss programme with restricted calories intake. INGREDIENTS : Whey Protein concentrate 80%, Whey Protein Isolate 90%, Permitted Nature Identical Flavour, Sucralose. Very Reliable Indian Brand !! Regular user of My Fit Fuel .. i have to say they have come a long way and have been bringing some best products in the market in recent times !! i have used almost all there products and very much impressed with all of them ! !